Soon after my TV show went on air and the online links became available, there were repeated requests for this recipe. Its interesting to note how recipes evolve and are handed down from generations. The recipes that you find here are those that I love cooking and eating and more often than not it would have a memory or a story attached to it which may come from my experiments and cooking in my kitchen or real life events that I happen to be a part of. In the place where my parents live, most of my neighbours happen to be good cooks. 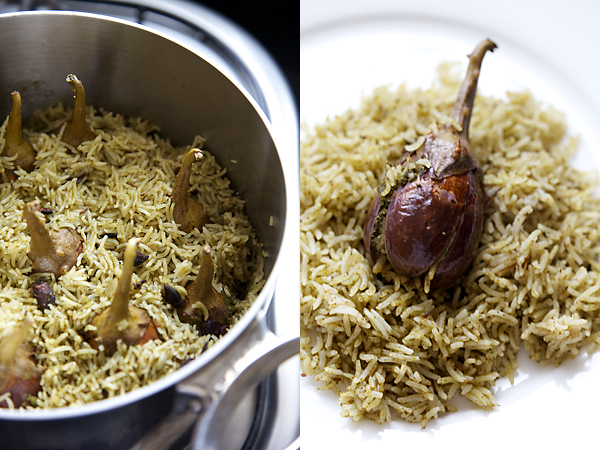 When one of the ladies was a young bride living in another town, she became intrigued by a meat stuffed eggplant biriyani that her Muslim neighbour used to whip up at frequent intervals. Being a vegetarian, she tried doing the same replacing the meat with vegetarian ingredients. The same intrigue was passed on to me when I came across this dish which was made at one of my pre wedding parties that our neighbours gave me and I tried to replicate the same dish in my kitchen using pure vegetarian or sattvik ingredients. I have cooked this dish many a time, feeding friends, family and loved ones and gaining their appreciation. Once my show went on air, I was totally humbled by the response I got from my coterie of friends, family and well wishers. This dish is a real delicacy and surprisingly this has been loved by people who don't like eggplants as well! It is also one of those dishes in which you won’t miss the absence of ingredients like onions and garlic which are commonly used in biriyani preparations. 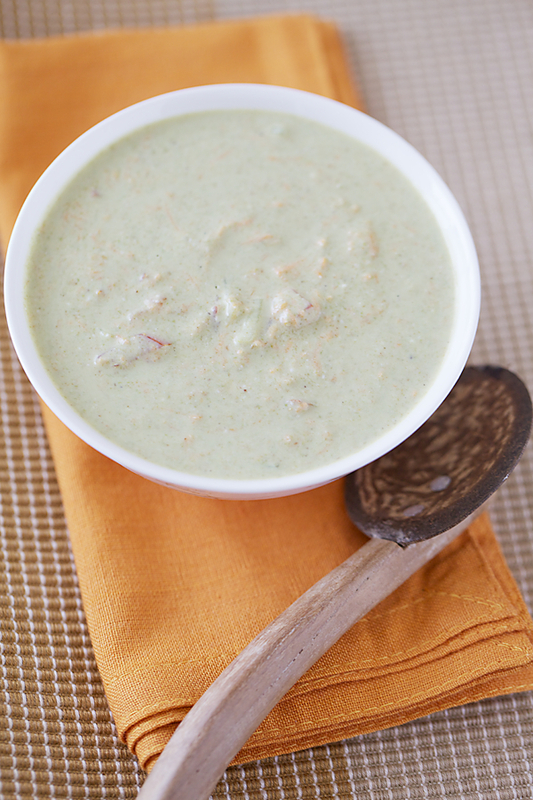 Served with the mixed vegetable raita, it makes for a very appetizing and hearty meal. At times, particularly when there are no guests, I just make this rice preparation and the raita. The taste and the satisfaction of these two combinations, lingers through the day. Here are the 3 part online links to the TV show on Times Now (which is one of India’s leading news channels) where I demonstrate how to make this rice. Hope you enjoy it! 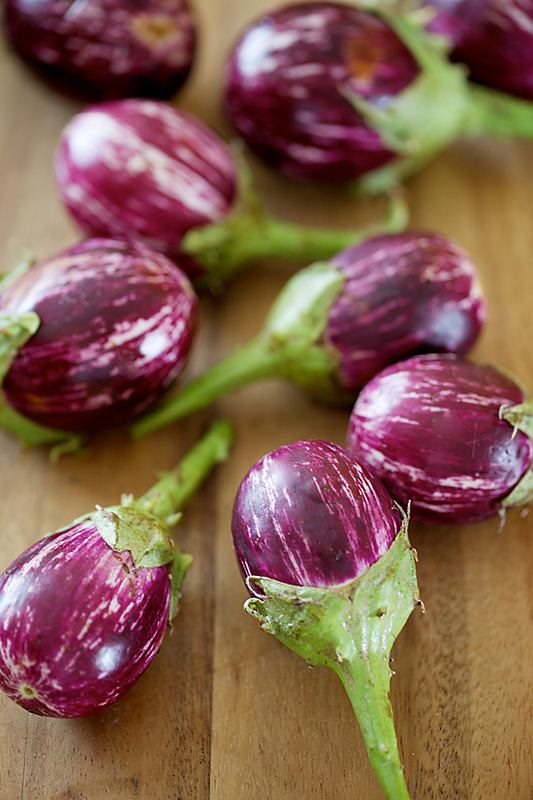 Choose young fresh eggplants to make this dish. 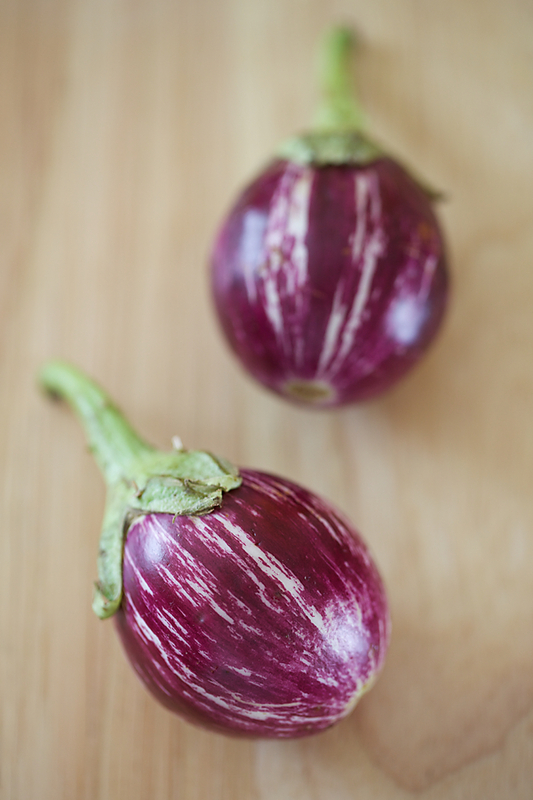 In India, the eggplants are generally not bitter, but if you reside in an area where you get bitter eggplants you might want to soak the slit eggplants in slated water for a few minutes to get rid of the bitterness. Wash and soak the rice in water for about half an hour. In a small skillet or wok, dry roast the spices on medium low heat for 3 to 4 minutes without burning them. In a blender or food processor put in all the ingredients for the stuffing, the dry and fresh ingredients and process to a smooth paste using very little water. This paste should not have too much liquid in it to prevent it from oozing out of the eggplants. With the help of a knife make four slits in the eggplants, keeping the stems intact. Stuff them with the freshly prepared paste and keep aside. In a stock pot or any pot with a tight fitting lid, heat the oil over a medium flame. Lower the heat and add in the whole spices. Stir fry the spices and add the prepared spice paste, reserving 2 to 3 tbsp for the raita. Cook until the raw smell of the spices disappears. Drain the rice and put it into the pot. Give it a good stir, add the water and bring to a boil. Put in the lime juice and the salt, cover and cook on low heat for about 10 to 12 minutes, until the rice is half cooked and the water is almost but not fully absorbed. Once the rice is half cooked, place the stuffed eggplants or brinjals all over the rice, cover and cook for 15 to 20 minutes, until the rice and the eggplants are cooked. Serve with the prepared raita. 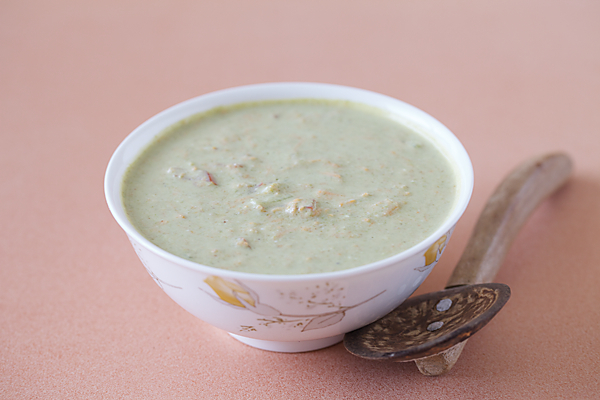 In a bowl, put in the yogurt and stir well with a whisk or spoon until there are no lumps. Put in the salt, masala paste and stir again. Add the prepared vegetables and mix well. * Cut a slice from the tip of the cucumber and rub it in a circular motion on the cut part to remove bitterness. A sticky paste oozes out of the cucumber and out comes the bitter juices. If you add a bitter cucumber then the entire raita gets spoilt so this step is very crucial. Saw the episodes. Fantastic and Simply delicious. This biryani is got to be tried before my mint plants dry out in the winter. The TV show was great! All the dishes were very inviting!! oh i expected this post. thanks a lot for this. 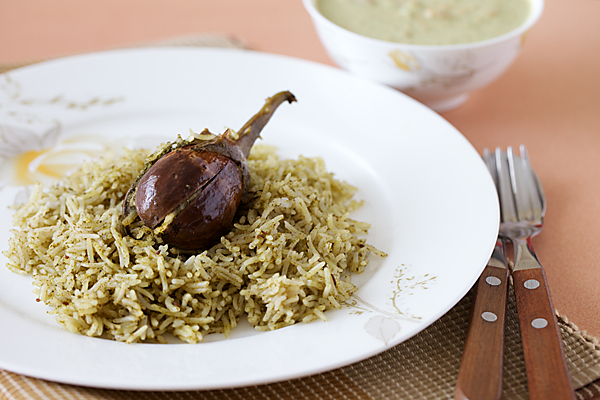 Interesting recipe and combination, I love eggplants and I love Biryani! 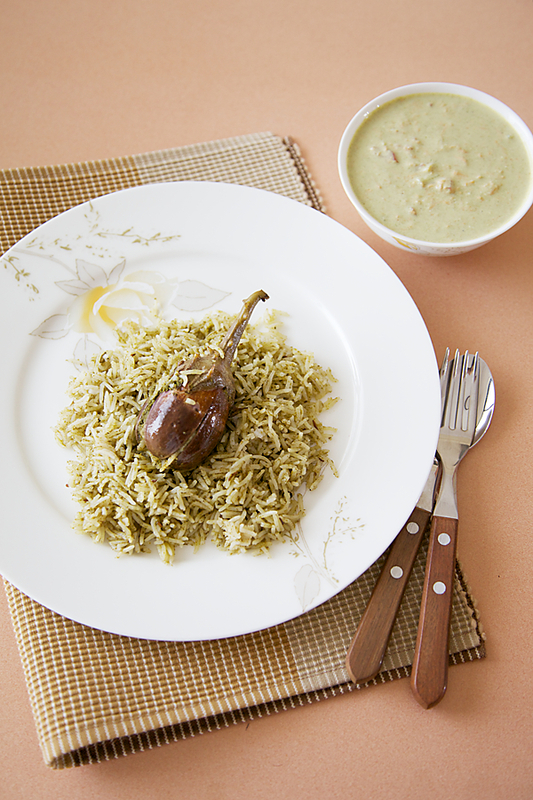 Stuffed eggplant briyani looks fabulous, never thought of making briyani with stuffed eggplants,awesome. I am a non-vegetarian.I have always felt cooking non-veg is more easy than cooking vegetarian food.While cooking non veg even if we put any ingredient unknowingly more or less it can be easily rectified.But vegetarian cooking is a little more difficult,if do one small mistake it will spoil the entire dish. I used to wonder how you used to cook veg food fantastically even without onion & garlic. I saw your program.Its super.The way you do cooking only shows you are a veteran.Usually in cookery shows non -stick cookware will be used.But you have used steel vessels.I liked it so much.Whats the material actually called for those cookware .From where you bought those vessels. One query- Can you use Garam masala in sattvic cooking? Which spices are sattvic? Lily: Thank you for your kind words. I agree with you, to make vegetarian food delicious requires a little skill, but it can be done. The steel cookware I used was from Sur La Table http://www.surlatable.com/ There is now good quality cookware available in India too. Traditional recipes are a treasure to keep..am a brinjal fan and this dish is surely in my 'to-do' list. And as usual you look gorgeous in the video! sattvik: Ocourse you can use garam masala in sattvik cooking. All spices except onions. garlic, shallots, chives and any members of the allium family cannot be used for sattvik ccoking. Please tell me what would be the quantity of biryani I need to prepare for 15 to 20 people? Glad you enjoyed it Shruti. Double the quantity for 15 people if you have other dishes. For 20 people you may have to triple the recipe. The show was awesome Anushruti…Congratulations! And hope this is the precursor to many more to come!! Could you please post the recipe for the baked okras too? They looked yummy and the way Little Hari was reaching for it tells me its gonna be a sure shot success with my toddler too..
Sreeja: Thanks! Will note your request! I love one pot meals, and rice dishes are my absolute favorite–this one is definitely bookmarked to try. 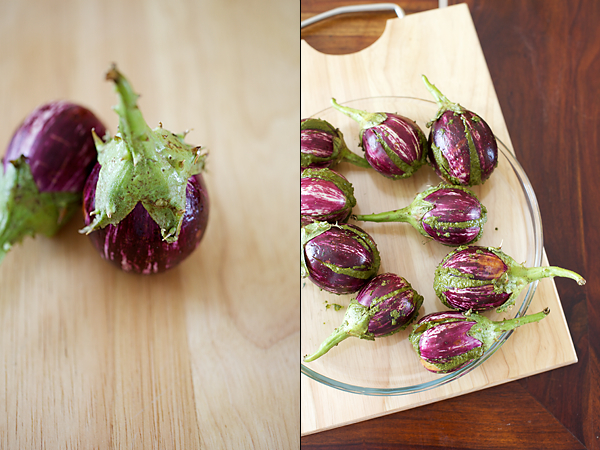 I love these thorny eggplant, and the undhiyu-like stuffing must really add a lovely dimension. Great pics, too, as usual! I have a basic question. Why do we soak the rice grains before cooking them? I have observed that when soaked, the rice grains become more vulnerable to breakage. I can even break them applying some pressure with two fingres. If so, then how does it help get long and separate grains after cooking like yours? Ashwini: When we soak rice, it absorbs water and the grain is elongated if Basmati rice is used and this process also helps in getting separate grains. Wash rice before soaking never after and once soaked drain carefully. If the right amount of water is used then you get long and separate grains. Ofcourse good quality basmati rice is also a pre requisite. Hi anusruthi, one small doubt. When u say add the paste after the whole spices… Do you mean we have to keep aside some paste for the rice. So the paste needs to be used thrice… I.e. for the stuffing in the brinjal, for the rice and for the raita?? ?